What year is your Bear Archery bow? Im totally amazed at how good everything has become for all of us traditional bowhunters. We have some of the most liberal hunting seasons here in the U.S. and most bow seasons are during the most beautiful time of the year to be out in the fields. None of us could ever thank enough the early pioneers of the sport that through their tireless efforts put bowhunting on the calendar for all of us to enjoy. Although with the relentless anti-hunters' threat, there is no doubt that bowhunting would cease to exist without the constant efforts of organizations like The Professional Bowhunters Society, The Pope and Young Club, The Wildlife Legislative Fund, The National Rifle Association and many other national and state organizations. Maintaining strong support and membership in these organizations is one very good way to keep a solid hold on the good old days. And while we're into these good old days, how about the vast equipment choices we have today? Have you ever seen as many bow makers as those listed throughout the pages of Traditional Bowhunter? All are ready to make a bow to your every wish and desire. Getting all the necessary information on new equipment is just a matter of a few phone calls and letters while pawing over several of the latest catalogs. No doubt many of the best bows ever made are being made right now. I'll bet some bowyer is making some new design right this moment that I can't live without. A quick way to gather information is to go to one of the larger traditional shoots that are becoming common all across the country. There are always dealers there with tables full of new and used bows and equipment which can be inspected, and in some cases, given a try out on some targets. For the hunter or collector that doesn't have one of these events nearby, getting information about the old Grizzly bow their father gave them or the old recurve they found at the flea market can be difficult. When was it made? Is it safe to shoot? What kind of string is best? What's the proper brace height? Lot's of questions arise, but few answers are available. There are no current books on the market that can help identify even the age of most old bows. Many of the local tackle shops came into business after most of these older bows were out of production. There is many a time when poor information is the rule here. Most of the bows made after the early 1950s are still very usable, but there are no guarantees that come with any of them. Some common sense precautions are necessary in the purchase and intended use of any old bow. By far the most popular and commonly found bow will be a Bear Archery recurve or longbow. I started collecting the Bear Archery bows in 1958 with a beautiful ~ 55# Kodiak. I was 13 at the time and I thought it was the most beautiful bow I would ever see. I've never stopped collecting them and it seems I learn something new about them every week. No, I'm no expert in them and may never figure it all out, but I have had my share come and go. Serial numbers started over from scratch each month during the 50s and 60s and every model had its own two letter code. The first letter was the year, second letter the month. With only a few factory records available for these years, I have only the bows left as pieces of the puzzle. I have spent many enjoyable days with many of the Grayling employees and even they are not sure of the serial ranges. They never dreamed that people would be collecting all these bows! There are tens of thousands of these great bows out there to be found and many more that their owners would like to know more about. Using the coin medallion to date these bows has been used by many knowledgeable collectors for years. The "coin" was Fred Bear's most recognized business trademark! Instant identity for every model Bear bow. The 1959 Bear catalog introduces the coin medallion as symbolic of high quality, precision performance and lasting beauty, a "symbol of the finest." Sure sums it up, right? If only the auto manufacturers had some coin medallions! (OOPS, a slip of the pen.) Although the coin is a major ID tool it is sometimes confusing. In 1959 both copper, nickel and brass were used in the higher and lower grades of bows. The bow varnish on top turns varying shades of yellow altering the color of the coins. In 1960-61, aluminum was used and in 1962 a pewter like metal was used; this coin oxidized badly turning the finish black. Most of this finish chips off leaving a very dull gray metal underneath. By 1963 only brass and aluminum in a new stamping was used (see photo). All coins overlap. They did not always change with a model change, but when used with other features, are still heavily used in bow dating. I use several other procedures to identify the Bear Grayling bows that I have made into a list. I have rewritten and expanded this list that I have used for many years. Taking 30 years worth of Bear bows would take a book, but for now this list will ID most Bear models almost to the year. I'm not about to cut all of this into stone, but try this out on your bows and it will work well to identify a very high percentage of them. I am open to any and all new ideas from other collectors. I still continue research of the Kodiak model, both right and left hand serial numbers. Writing is best as I'm away so much. Any SASE will receive a reply. Good luck and good "bow hunting" during the Good Old Days! 1. The early Grayling bows of 1947-48 were static recurves called the Deerslayer, Bush Bow and Hunter, plus three longbows called the Field, Rover and Ranger. These models evolved from the superbly hand-crafted bows of Nels Grumley, Fred's first bowyer. 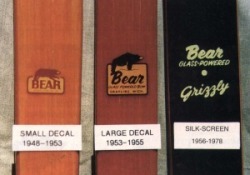 The bear logo and model names were applied with stick on decals. The logo decal was 7/16" high with a running bear and read "Bear, Grayling, Mich." This decal continues until mid 1953 when it is enlarged to 3/4 of an inch high and includes the words "Glass Powered Bow." This decal continues until mid 1955 when the silk-screen marking method begins to replace it, and this change came about gradually until early 1956 when all models had the silk-screen marking identification. 2. The first "Bear" named bow was the Grizzly in 1949. The Kodiak and Polar appear in 1950. The Ranger continues but all previous model names are dropped. The Cub replaces the Ranger in late 1951. The Grizzly, Kodiak and Polar longbow all have an aluminum limb lamination from 1949 to 1951. These bows should not be used! 3. Every model Bear bow made from 1953 to mid 1972 have the 1953 Canadian patent for the working recurve design on the lower limb. This is a patent date only, not the year of the bow! Also all model Bear Bows have leather wrapped grips from the late 1930's up to 1959. The 1959 Kodiak Special was the first bow model to drop the leather grip. Then the Kodiak in 1961 and the Grizzly lost it in 1964. 4. In the 1950's and early 60's, the serial numbers were started over every month every model. This makes these years very difficult to identify by serial numbers. From 1965 to 1969 the first single digit is the year of the bow (Example: 8Z1254 = 1968) The "K" serial numbers started in 1970 KZ, KU, KT, etc. The sec ond letter was the model designation. 5. The first year for the "coin" medallion (flush with bow surface) was 1959. It was copper metal that year, 1960-61 was aluminum, 1962 pewter. These all have a "Flat Bear" logo. In 1963 a brass coin with a new stamping of a "Rounded Bear" logo appears. Also in 1963 a "Rounded Bear" coin in aluminum begins in the lower class bows like the Polar and Cub. This same aluminum coin reappears in the Grizzly model in 1970 to 1972. Also in 1970 and 1971 a few nickel silver coin medallions appear in top model bows. These are scattered and are identical in appearance to the aluminum. As with "all years" these coins all overlap, so precise dating could be difficult. 6. Late 1972 started what was called the "Button Medallion". It was positioned high up in the handle and was raised above the surface of the bow. It came in both gold and chrome covered plastic. These replaced all coin medallions and continued into Florida production. 7. Only the catalogs ran from January 1st to December 31st. Bow model changes ran from September to September and many times came about at any time of year. Two different versions of a model were made at the same time until orders for existing models were satisfied. 8. The famous wood handle takedown bow started production in August 1969, but did not appear in the company catalog until 1970. Although discontinued in 1972, a few "A" and "B" wood risers were assembled between 1973 to 1976. Most of these will have white serial numbers in place of gold, and also will have black plastic bear logos on the sockets instead of brown. Also, many of the company catalogs show a model using the same picture of this model for two or more years, yet materials and glass colors may have changed each year. 9. Handle riser wood from 1948 to 1958 was mostly Michigan maple with some walnut. In 1959 Brazilian rosewood started along with the African hardwoods of Shedua, Bubinga, Tigerwood, Pau-Ferro and Zebrawood. 1964 we find East Indian Rosewood in the top of the line models. In 1965 appears H.C. or high compression material. This is formica, a paper and resin laminate (not ebony wood). It is also used on the Super Magnum and Super Kodiak in the late 60's (I call these the Black Beauties) and parts of the HC 30, HC300 and Tamerlane target bows. By 1973 all model Bear bows are made of futurewood. (A colored polymer plastic impregnated maple) some models as early as 1970. 10. The last year for the Grayling, Michigan bows was 1978 when the entire plant was moved to the current Florida location. Below is my chart of the yearly production of the popular Grayling made bows. Check the Model of the bow. Below is a yearly production chart for the most popular Bear Bows.